A little color goes a long way at your ceremony! 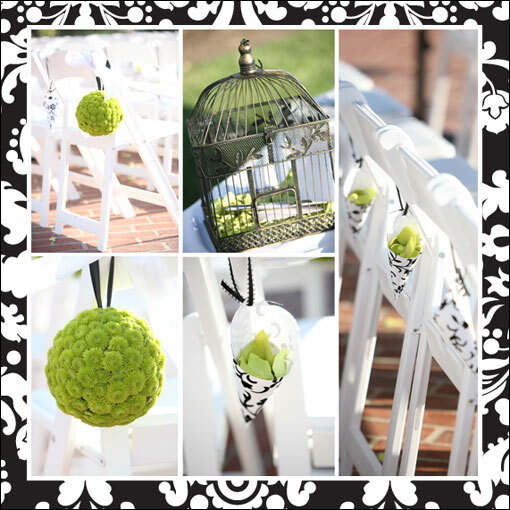 These green pomanders really pop against the white chair! How darling are the the petal cups in black and white brocade with green petals? Well, we think that they are super darling! Oh, and loving the birdcage! This wedding courtesy of Kiley Walker Events. Ceremony Tip: If you are going to have petals to throw for the recession, be sure that your ushers inform guests on what to do with them! They should mention that they are there to be thrown as the Mrs. & Mr. come back up the aisle! Sometimes the petals go to waste because the guests don’t know what to do with them!